In response to this criticism of the victim, a survivor of domestic abuse, Beverly Gooden, shared her story of why she stayed in an abusive relationship. Soon after, more and more women began to share their own stories on Twitter under the hashtag, #WhyIStayed. As the conversation proliferated, more survivors came forward with their stories of leaving their abusers, and another hashtag was created: #WhyILeft. The posts quickly became the #1 trending topic on Twitter in the United States. Based on the scale of the viral #WhyIStayed #WhyILeft Twitter conversations, the event represents a milestone in domestic violence history, as thousands of abuse survivors came forward independently on social media to tell their stories. To commemorate this anniversary, Tremendousness has teamed up with Big Mountain Data—an organization focused on data-driven solutions to help in the fight against family abuse and violence—for the release of new insights into the impact of domestic violence on women, including why many stay in abusive relationships and why they ultimately leave. Big Mountain Data recognized the importance of this Twitter phenomenon as a turning point in the public conversation on domestic violence. The organization aggregated the activity over the period September 8 to December 1, 2014, to reveal the scale and magnitude of the survivor voices who came forward. The conversation spiked on September 9 with 77,544 tweets in one day. 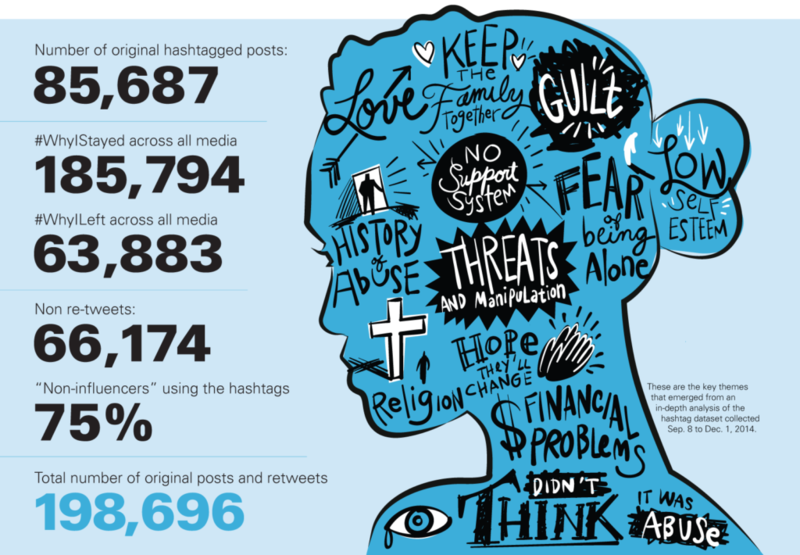 With 85,687 original hashtagged posts and mentions, and nearly 185,794 posts and retweets for #WhyIStayed and 63,883 posts and retweets for #WhyILeft, the results provide a glimpse into the complexity and scale of intimate partner violence. Most importantly, the fast-paced, viral exchange empowered survivors to come forward en masse from out of the shadows of an abusive past. Survivors found refuge and resolve in the community that grew organically with each subsequent tweet and media mention. Big Mountain Data has presented the findings of this analysis in an infographic and a detailed presentation. The company will also offer the data on its open data platform hosted by Socrata, enabling researchers to conduct their own in-depth analysis on this important subject. Here's a link to the full PDF of the infographic.